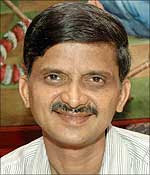 Suresh Kamath, the managing director of Chennai based Laser Soft Infosystems Ltd is an unusual man. Unlike most other entrepreneurs, he does not aspire to create a business empire; his sole ambition is to provide employment to 10,000 people. He also plans to reserve 40 per cent of the jobs for the disabled. Suresh started Laser Soft in 1986 with just Rs 200 and five people. Today, the company is a force to reckon with in the banking software arena. In recognition of his commitment to the disabled, President of India A P J Abdul Kalam felicitated Suresh with the Best Employer award in December 2005. He also won the Best Employer award from the Tamil Nadu government. He has been awarded the NCPEDP shell Helen Keller Award for giving equal rights and gainful employment to persons with disabilities. I come from a poor family. We lived in a one-room-kitchen house in Mysore. Though my father struggled very hard, he did not let his penury affect the lives of his children. Unemployment, depravation, hardship pained me and right from my school days my ambition was to create employment in this country. As a child I was motivated by Mr Laxman Rao - one of my teachers at school who always advised me to do something for the country. I heard tales of poverty and struggle from my father and grandmother. How my father could study only up to the 10th standard, as he did not have money for further education. My mother too did her schooling only till the 8th standard. But all this hardship did not stop them from encouraging us to continue with our studies. I was the eldest among my siblings and took up the mantle of setting an example. Encouraged by my performance - I was always a rank holder - my younger siblings too did very well in studies. e Indian Institute of Technology, Madras. I was keen to start my own company immediately after my post graduation. But since I did not have any job experience I was advised against any such move. So, I joined Tata Consultancy Services and worked for a year. I noticed that all the major Indian software companies were into services; they were not into creating products and it disappointed me. I was convinced that India could create excellent products thanks to the huge talent pool available here. While at TCS I found that most of my colleagues aspired to go abroad to further their career. But I was not interested in overseas assignments. n called me a 'fool'! I took their scorn in my stride. However, my parents were very supportive. They encouraged me not to pay heed to what others were saying and encouraged me to strive to give shape to my ambition. After TCS, I joined another company that was into hardware because I wanted some related experience. I worked there for three years. e May Day as it is also labours' day. With initial capital of Rs 200 and five technical people from NIIT the company was launched. I told them, 'I will give you whatever I can afford but all of us will draw the same salary.' I did not even try to hire any engineers, as I was convinced that they won't work for a small company like mine. Also, I strongly believe that you don't need engineers for programming. What you need is logic. I also wanted a team that would be the foundation of the company, who would remain with the company. Why Laser Soft? Because the word laser - meaning accuracy and precision - appealed to me, and soft is of course from software. Our office was a room in my house, and our first job was to get visiting cards and letterheads printed. We decided to focus on banking and healthcare. Banking because it was a gargantuan sector and had huge potential. At that time automation of the banking system was a faraway dream. We approached the State Bank of India and Apollo Hospitals and told how our products could facilitate their work. SBI admitted that they had a six-month backlog in the DD purchase for Madras Fertiliser Ltd. Since we did not have computers, we requested SBI to allow us to work in the bank in the evening. They agreed. Our product for SBI was out in two weeks' time and the backlog was cleared within a month. Our first product was thus a big success. Both SBI and MFL were very happy and we were paid a remuneration of Rs 5,000.
uarters, SBI sent us to their overseas branch -- which incidentally was their largest branch in the South doing business of over Rs 5000 crores. Everything was done manually. On any given day the branch could take only 25 bills from the exporters. Our product, readied in a week's time, was exclusively for handling export bills. From 25 bills, they were able to handle 200 bills a day and the profit of the branch zoomed to Rs 55 crores (Rs 550 million). By the end of the first year, our turnover was Rs 128,000, and our staff strength had doubled to 10. With Rs 1000 as monthly salary, we could manage. After the success of the export bills, SBI assigned more work to us. As our work pressure increased, we hired more people and by the end of the second year we were 25 people and our profit stood at a handsome Rs 600,000. In five years' time, we computerised 70 SBI branches all over India. had offered in an institute. I told Partha, "I like to employ people like you." And it was not a wrong decision. Partha had an amazing zeal and his disability did not stop him from being mobile. I thought it was the right model for any industry to follow. At that time our office was in the first floor and Partah had difficulty tackling the stairs. Seeing him struggle, I decided to make the entire office disabled-friendly. Our ground floor is now exclusively for the disabled people, and we have ramps in our office and there are special toilets for them too. We have also built houses for them near the office so that they can avoid long travelling hours. After meeting Partha, I decided to hire more disabled people. We waited six months to get a disabled person who could be our receptionist. I don't look at employing disabled people as charity. I look at this as my responsibility. This country has spent money to educate me and I feel it is my duty to do something for the less privileged. It had been a great experience working with them. Seeing them work, get married, settle in life and have children is a wonderful experience. We have 550 employees now, and 15 per cent of them are disabled. 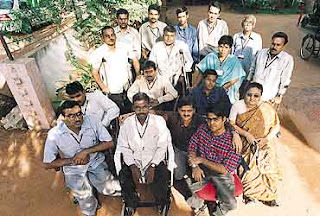 We go to engineering colleges looking for disabled people but find only one or two in each college. Parents don't send them out. The biggest challenge for the physically handicapped is the attitude of their parents. We, at LaserSoft, hire them even if they are not engineers. Other than the physically challenged, we have people suffering from cerebral palsy too working for us. We find them good in graphics. Many of our employees are deaf and dumb. I was elated when I won the award but with all humility, let me say I am doing very little. I am very disappointed to see that I was chosen when there are so many business giants in India. Seven per cent of India's population is disabled but all of us turn a blind eye to them. I realised that if I could get an award by doing so little, it means that others are not doing even this much. I was honoured to meet Dr Abdul Kalam. He is a wonderful person, a real motivator. He asked me, 'What exactly do the disabled people do in the company? Do they do software or menial job?' I told him barring two all are involved with technology. My ambition is to create 10,000 jobs, and I want to reserve 40 per cent of that for the disabled. We also have a light top model as far as salaries are concerned. We don't give huge salaries to those who occupy the top positions but distribute the money to all the employees. Reservation based on caste is going to divide us further. Reservation should be based on economic criteria alone. We should learn to forget our past and start looking at the future. What have today's children got to do with what some people did in the past? What difference does it make if you are a brahmin or a non-brahmin when you are poor? How many IITs and IIMs do we have? How many good medical colleges and engineering colleges do we have? We have such a vast population but not enough resources. Instead of starting more colleges, and there should be special colleges for the disabled, the government is talking about more and more reservation. 3,500-year-old Investment Tips that still works! A book was cast in stone more than 3,500 years ago in Babylon and was found by a British professor late last century. What impressed him -- and helped him come out of a debt crisis -- were the inscriptions on how to manage one's finances. The book is now available as The Richest Man of Babylon. It's a very small book, but with some very profound thoughts. When we think of budgeting against our income, we typically look at our expenses: how much do I have to pay my landlord, my grocery bills, my medical expenses, my entertainment bills, et cetera. Once we have decided on our expenses, we find out what our savings will be. Financial advisors and many credit card companies (or banks) today help clients in estimating their lifestyle expenses and help them understand where their money is being spent. The old book turns this theory on its head: it says 'pay yourself first.' Before you pay others for the services that they give you, you should save money for yourself. You are working for yourself and not just for paying your bills and, hence, you should receive a fair share of your income for yourself. The Richest Man of Babylon decrees that you should pay a minimum of 10% of whatever you earn to yourself. And the best thing is: once you have paid yourself, you will realise that your lifestyle does not change at all! In today's consumption-driven world, this simple philosophy takes a back seat. It is important to nip the temptation of over-spending at the bud. With facilities like ECS available today, it is easy to transfer money to investments as soon as income is received. For the clients that we have done that, they say that after the first couple of months, they have become used to the lesser disposable income, and do not feel the pinch in their life style at all. The Richest Man of Babylon says that the only way for your money to grow is if it procreates. Using a wonderful analogy, it states that the money saved -- and invested -- is the father and it should bear children. The joy -- and the secret to financial independence -- lies in seeing the children grow bigger than the father. It is very instructive to learn the difference between savings and investments. Indians typically 'save' a lot -- as demonstrated by the savings to GDP ratio of around 30%. However, in many cases, savings do not translate into investments, which earn returns. Leaving money in the savings account for a rainy day is not investment. Such savings are like impotent people, who are progressively eaten away by age -- and inflation. With the development of the financial markets, there are many avenues in which savings can be easily invested to procreate. Depending on your circumstances and requirements, you can invest in equities, real estate, long-tenor fixed deposits, etc. The idea should be that the children (the interest or dividend or capital appreciation) is so large that they can support their original father -- you. Once your passive income is enough to sustain you, you are out of the rat race. It is not always that the best intentions produce the best results. After having saved for one year as decreed by The Richest Man in the book, his disciple gave all his money to a merchant who was to go into far seas in search of the spices. Neither the boat, nor the man returned and all the savings of the disciple were lost. While it is important -- rather it is a prerequisite -- that you need to take some risks to earn returns on your savings, you need to be careful in evaluating the risks that you can/should take. The first thing that you need to understand is the amount of risk that you are able and willing to take. It is easy to confuse between the ability and willingness -- and this is where you will need the assistance of your financial advisor. Depending on your circumstances, you should define the amount and nature of risks that you can take. If you are nearing your retirement and have painstakingly built your nest-egg over your working life, it is important for you to ensure safety of your principal. Conversely, if you are young and without responsibilities, you can risk your savings for higher returns. After losing the money with the sea merchant, the disciple wanted to give up on saving and investment, saying that it is an illusory game leading to losses and pain. The Richest Man warned him not to lose heart and to continue the process year after year throughout his life. When the disciple invested -- more cautiously -- the second time, he not only received his principal back, but also received handsome interest. It is easy to be lost in the maze of headlines and advisors who talk about the uncertainties in the markets and thePublishir abilities to time and make more money out of it. While one can try to get that extra return by tactically optimising on the portfolio allocations, what should not be lost sight of is that the mantra to investment success is to be disciplined. There will be shocks on the way, but it is important that your savings are working for you. It is surprising how the logic of wealth-creation written down millennia ago is still relevant today. The British archeologist who found these stone tablets was in a debt crisis, with credit card companies knocking at his door daily. By following the simple dictates above, he not only made his life debt-free, but set out on a path to financial independence!